Rommel Juan, President of the Electric Vehicle Association of the Philippines (EVAP) today has expressed optimism for the electric vehicle industry amidst the government’s impending PUV Modernization Program that includes the iconic jeepneys. “The Department of Transportation is finally on the verge of implementing this historic modernization program for public utility vehicles which aims to drastically improve the mass transport landscape and help reduce or eventually eliminate toxic air pollution on Philippine roads. 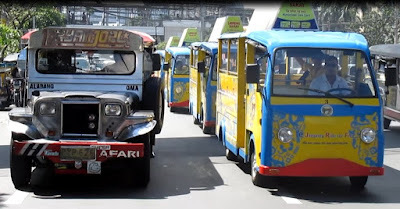 This is because not only will the 15-year old jeepneys be upgraded to new ones but the power train will either have to be the environment-friendly Euro 4 engines or alternative-fuel type like electric and hybrid, LPG, LNG and CNG. With the political will of the Duterte administration, we think this will finally happen”, he adds. The DOTr and its attached agencies together with the Department of Trade and Industry through its Board of Investments and the Bureau of Philippine Standards, the Department of Finance, the Department of Science and Technology with its Technical Education and Skills Development Authority and other government agencies are all working on this program. This is expected to be launched on May 31, 2017 with an initial budget of One Billion Pesos to be made available through Landbank. Juan explains that the biggest stumbling block right from the very beginning has always been retail or consumer financing. “Now, they have come up with a financing program that will finance even new air-conditioned jeepneys to the tune of 1.4 to 1.6 million pesos each through Landbank. Non-air-conditioned jeepneys could be had for from 1.1 to 1.4 million each. This financing scheme will entail a very low downpayment and will be a boundary hulog scheme of eight hundred pesos per day for seven years at 6 percent interest. The best part of this program is that after the seven-year loan period, the driver ends up owning the new jeepney. This would never have happened under the old boundary system with an operator”. The Landbank estimates that with its initial one billion peso loan portfolio for this year, it can finance an estimated 650 to 700 units of new jeepneys to get the ball rolling. “We are sure that there will finally be an opportunity for electric jeepneys to come in to serve the inner city with short distance routes, and we already have EVAP members who have the products that suit this need”. For the Euro 4 jeepneys, EVAP is currently working with the Chamber of Automotive Manufacturers of the Philippines, Inc., the Truck Manufacturers Association and the Automotive Body Manufacturers Association of the Philippines (CAMPI) to formulate the standards for the new modern jeepney in coordination with the DTI and the BPS. Member companies of the Philippine Parts Makers Association are also gearing up in preparation for a bigger demand for jeepney parts. Juan reveals that EVAP and the entire automotive industry are passionate about growing local industries, specifically on generating fresh investments, generating new jobs and providing business opportunities for MSMEs that comprise the bulk of automotive parts and components suppliers. “That is why we are pushing for local manufacturing and assembly of the new jeepneys by plants accredited with the Manufacturer, Assembler, Importer and Distributor (MAID) Program of the Land Transportation Office. The jeepney is a Filipino icon so it should retain the characteristics and charm of the original jeepney across all the islands of the country. But of course with a modern touch, new driver attitude, automated fare collection system, wifi, gps, cctv, speed limiter and even air-conditioning to boot”. So you call the one on the right modern? It looks like it's from the 80's. Do better come on, or at least just paint it plain white or silver for a cleaner look. A welcome idea, but a very tall order. With EV PUVs, there will be less noise, less pollution and hopefully less accidents. I want to be proven wrong. Personally sana makapasok na yung EV even as private motoring. Good idea, but a very tall order. With EV PUVs, there's less noise, less pollution and hopefully with less components - less accidents. Very pessimistic about widespread adoption as it will displace established means of living - from gas stations to parts and lube makers, to talyers to operators, drivers and relyebos. The loan is another story. Ano kayang ipapalit nila sa mga jeepneys na ang ruta ay mga bandang bundok. Tulad ng pa Antipolo, San Mate etc. Kakayanin kayang umakyat ng EVs dun?